Artist Talk & Painting Demonstration: Sunday, April 15, 2018. 3pm – 4pm. 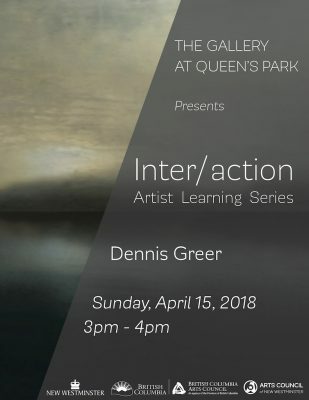 Dennis Greer received a BFA, majoring in painting, from the University of Alberta and a Graduate Diploma in illustration from Sheridon College of Art and Design in Oakville, Ontario. Upon graduating from the UofA he was immediately employed as an illustrator/graphic designer for the Edmonton Separate School Board where he illustrated various books and posters curriculum materials. He then went on to be an illustrator and museum display artist with the Government of Alberta, in the Historic Sites Dept. and after moving to British Columbia, was, for over fifteen years, the “Artistic Coordinator” for WorkSafe BC where he designed and illustrated various safety related manuals and posters. His teaching experience includes stints with the UofA and Grant MacEwan Community College in Edmonton as well as Vancouver Community College and Emily Carr University of Art and Design in Vancouver. He is currently teaching drawing and illustration at the University of the Fraser Valley in Abbotsford, B.C. Greer’s home and studio is in the Commercial Drive community of Vancouver, British Columbia. He is currently working on paintings for a show in Hung Jo China in the fall of 2018.